This is a power year for Pisces as your ruling planet; Neptune goes direct in your sign on 2/3 and changes everything. This transit will last for 14 years and enhances your natural qualities and brings an even greater awareness of everything, from what you feel your life is lacking to how you love another. The qualities for which you are known such as dreams, creativity, and psychic abilities will be magnified under this transit and you will know within an instant whether or not you are on the right track, personally, socially and/or romantically. This planet has been referred to as "a veil" in Astrology because Neptune represents what we can't see clearly. This life changing transit will open your eyes and remove any veils in order to show you where you are, how much progress you have made and how you have changed over the past 2 years. This is your year of prosperity and personal fulfillment, along with a heightened sense of intuition. Gone are the days of doubting yourself or your ideas. 2011 was a year where you learned about love and what you learned was priceless. You have built a solid structure, as you will see, as 2012 opens, Pisces. So get ready for good times, accurate awareness and being in touch with your conscious and subconscious thoughts. Venus (Love planet) begins the year in Aquarius and your 12th House. Love could be heating up in private behind closed doors with someone you prefer to spend alone time with. If single, you could become involved in a relationship that is secret in nature or it could be that you are in the early stages of love and want your partner all to yourself. This planet changes signs every few weeks and can stay in any given sign for a longer period of time when it wants to. On 1/14 - 1/24, the planet of love enters your sign and you will find that it doesn't get any better than this, Pisces. You will begin the New Year looking fantastic, feeling the love and opening your eyes to new ways of doing the same old routines. Pluto remains in Capricorn and your 11th House of friends, hopes and wishes. This House of friendships also includes past loves. Social changes, friendships ending and new ones forming have dominated your life since 2008 when Pluto entered Capricorn. Take note of how friendships have transformed, ended or begun during this time. Get used to this powerful planet in your 11th House. Put some extra effort into existing friendships and to any groups which with you affiliate yourself. You exert great power wherever Pluto falls in your horoscope. The only obstacle is you, Pisces. So if you're seeking the best possible social life, you need to put in the time and effort and networking in order to reap the reward. Conversely, if you don't seek out and maintain your relationships, you might be saying farewell to some relationships that have for whatever reason outlived their purpose. Realize that your intuition will be razor sharp and you will know without knowing who is a keeper and who is not, personally, professionally and otherwise. 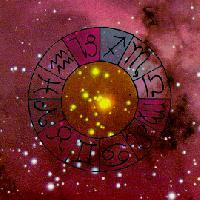 The year Mars will be in Virgo until it turns retrograde late in January and resumes direct motion in April. Some Pisces could be dealing with divorce or separation, while others are getting attached or have already found their true love and are making major changes where the 7th House properties are involved. Those are the topics of marriage, business relationships, contracts, divorce and open enemies. There might be some who are jealous of your natural luck and would love to have what you have, Pisces. Maximize this short transit by remaining in daily communication with VIPs and make sure you and your partner are on the same page. Mars gives you the energy and stamina to get through any of these areas quite easily and effectively. 2012 is going to be a brand new year with a fresh perspective and could change the way you view love and love affairs for a long time to come. In fact, your attitude about all relationships will undergo profound and permanent change throughout the year. You begin to see these changes yourself when Mars turn retrograde in Virgo on 1/24. Jupiter is the planet of luck and expansion, and as 2012 begins it transits your 3rd House of communication, siblings/relatives and short distance travel. These areas will be considered prosperous for you as they will expand and bring you much luck. In the summer, Jupiter enters Gemini and your 4th House of family, Pisces. This brings more expansion to your home and family life. These areas will be very fortunate for you throughout 2012. A Cancer and a Capricorn could play key roles. Private and confidential to Pisces: Uranus (Surprises) is now in Aries and this will bring change, unexpected surprises and shake ups where finances are involved. Learn to be a saver not a spender this year, Pisces. You will most definitely have your mind on your money and perhaps even that of a partner's as well. Stay on top and remained focused where you income is involved and realize that change, surprise and the unexpected are on the agenda when it comes to cash in 2012. Saturn will be in Libra, your 8th House, which might require you to adhere to rules you had hoped would magically disappear. This planet asks you to change your ways of thinking and consider life from a totally new perspective. This transit has lasted since 2009 and in October it will enter your 9th House and form a beneficial angle to your Sun sign and make things somewhat less hectic, especially when it comes to adjustments in your income and that of your partner. Saturn will enter Scorpio in October where it brings relief and a collective sigh.